Approximately three centuries before Christ was born at Bethlehem, during the Sangam Age, the Tamil country in south of India was already flourishing. 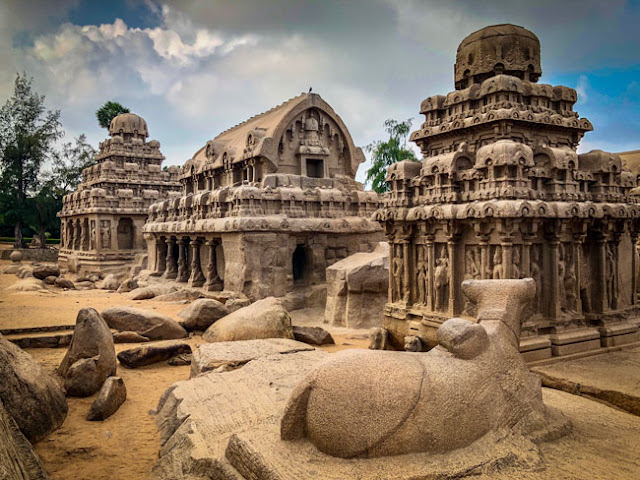 However, the story of Mahabalipuram as we know it today starts during the 7th century during the reign of mighty Pallavas, who ruled from Kanchi near present day Chennai. It was a time of rivalry between three key south India dynasties - Vatapi (Karnataka), Pallavas and Pandyas (south Tamil country). However, this rivalry wasn’t just limited to the battelefield, but also extended to the area of art, architecture and literature. It was during these restive, yet exciting times, that Mahabalipuram flourished. 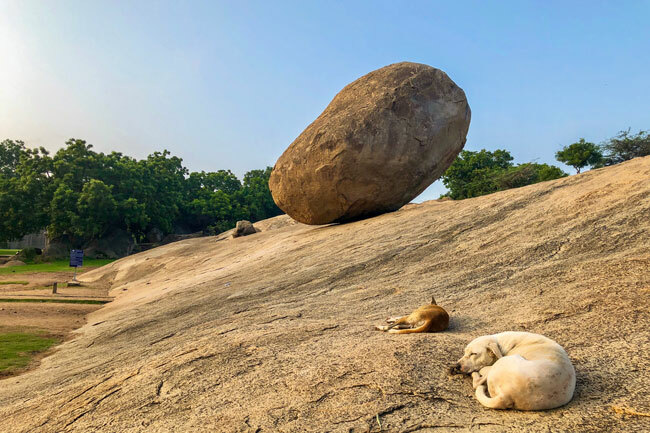 So what exactly is Mahabalipuram? Mahabalipuram was already a well-known sea-port and was even written about even in the Greek empire. The present day name itself is derived from Mamallapuram, of the city of Mamalla, the title of Narasimhavarnam I. He lived during the seventh century and is credited with commissioning most of the temple work done here. If you find names of all these kings and dynasties confusing, don’t worry about it. Its a daunting task for me also to research and write about them, and trust me this is the simplest possible version of Mahabalipuram’s history. But why do I write so much about history? Does anyone even care? Well, I do because I care about history a lot. It fascinates me, and reading about history actually takes me back in time and allow me to relive some of those moments in my own dreams. Also, I do genuinely feel that there would be others like me who love history as much as I do. Plus, history allows us to take pride in the achievements of our forefathers. This is absolutely important and I hope I can inspire the present generation to read and learn more about our glorious past. When I visited Mahabalipuram, I already had some notions about the temples and the architecture style here. Unfortunately, I didn’t know it all and appreciate the variety of styles of the temples here. I am not an architect, but let me share a simple version. The one common element binding the temples here is the fact that they are all made of stone, the other being that they were all built by Pallava kings. The Panch Ratha (five chariots) is actually a monolithic temple all the five rathas are carved out of a single stone. The shore temple, on the other hand, is a masonry temple from the time of Rajasimha. The temples might look similar, but the construction methods are completely different. The masonry/ structural temples started during the time of Pallava kings and co-existed with the rock-cut temples, but by the time the dynasty ended, rock/temples were already a thing of the past. My visit to Mahabalipuram was as unplanned as it could be. I was actually on my way to Pondicherry for the weekend when something came over me and I changed my plans and got down on the highway. I booked my cab online and called it for directions. The guy at the reception was kind and actually sent his man in a motorcycle to pick me up. As soon as I entered the town, my first reaction was that of surprise. 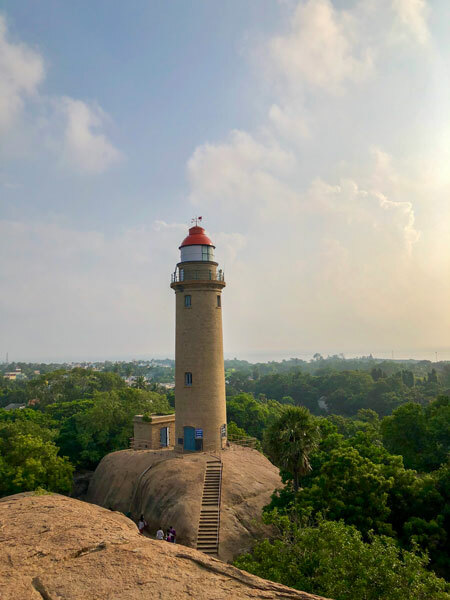 I'm had somehow assumed Mahabalipuram to be a quaint religious town, and the lanes lined with cafes and Goa-like flea markets changed my perception. There were mostly international guests strolling and chit-chatting. Many Indians visit the town as well, but most do a one day trip and don't stay for the night. Foreigners often stay for days, some doing Ayurvedic therapies like Panchkarma while others just want to relax. There were a few shops selling Kashmiri goods and I had a good chat with a couple of young chaps from Srinagar. They were here for only two months and were so happy to hear someone talk to them in their language - Urdu for them, Hindi for me. It seems I was the first guy they could speak to properly in days. On my first time I didn't see any signs of temples or any religious activity. I did see a lot of alcohol (I also guzzled down big bottle of Kingfisher Premier), and people generally having a good time. 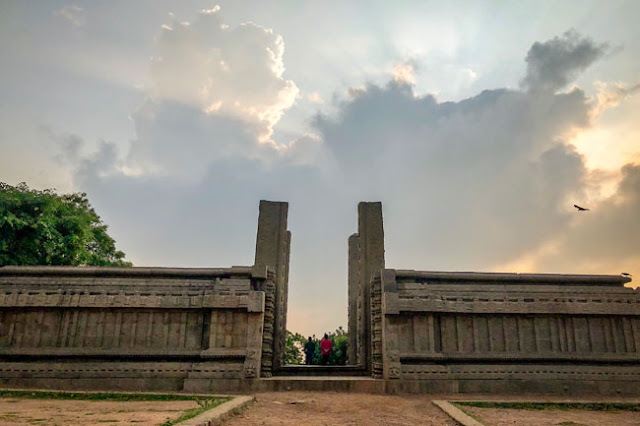 Anyway, now that we know a little about the history of Pallavas and a architectural styles of the temples, let’s explore things to do at Mahabalipuram! Built in the 8the century, the temple is one of the finest examples of early stone structural temples. Due to it proximity to the sea, the temple has seen extensive decay over the years, though conservation work has slowed down the process. The temple opens to visitors at 6am and I would recommend starting your Mahabalipuram right at this temple. The resplendent morning glow of the temple will surely blow you away. Though it has no connection to the epic Mahabharata, these five beautiful temples carved from a monolith is named after the five Pandavas and their wife Draupadi. 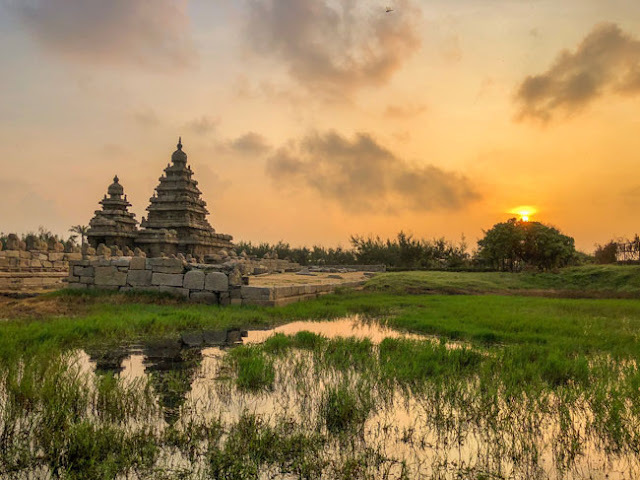 Even though the Shore Temple is the most famous landmark of Mahabalipuram, I think I am split between the shore temple and the Panch Ratha when it comes to picking my personal favourite. It’s located about 1.8km from the Shore Temple and you can easily walk the distance on a cool winter morning. I would suggest visiting this landmark right after you are done with your morning tea after exploring the Shore Temple. There is parking outside the complex. This massive 30m wide and 15m high relief is possibly the most famous relief from the entire Mahabalipuram area. The carving tells the story of Arjuna penance as well as the story of Ganga's descent from heavens to earth. 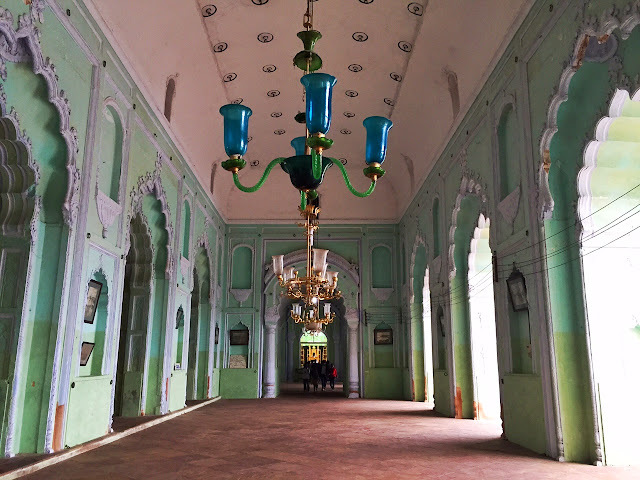 It was built by Narasimhavarman 1 to celebrate their victory in the battleground and is a unique example of open relief work found nowhere else in India. The butter ball is really just a large stone which is interestingly placed on the incline of the hill. It's a very popular place for pictures for all tourists. Built by the Pallava Dynasty, the Mahishamardini cave is located near the lighthouse and certainly a must-visit. It's also one of those places which are easy to miss because you won't know about it unless you are already there. The temple is full of many beautiful sculptures, but the one that stands out the most is the one of reclining Shiva (image below). The lighthouse is located on the same hill which has many of the protected Pallava era sites, but it’s newly built. It’s the best way to see the town from top and get an idea of what the place looks like from top. The Shore Temple looks beautiful, but tiny in front of the huge coastline. This is actually the one part of Mahabalipuram which gets the least importance and visitors often making a passing visit here. However, in my opinion it’s a must visit part and one can easily spend hours walking across the hill and stumbling upon numerous historical remains. Mahishamardini cave and butter ball are part of this, and some of the other key interesting places include as mentioned above. If you are interested in sculptures, a Mahabalipuram is one of the best places to explore store sculptures in there making. There are numerous shops selling marvelous sculptures mages by local artists. 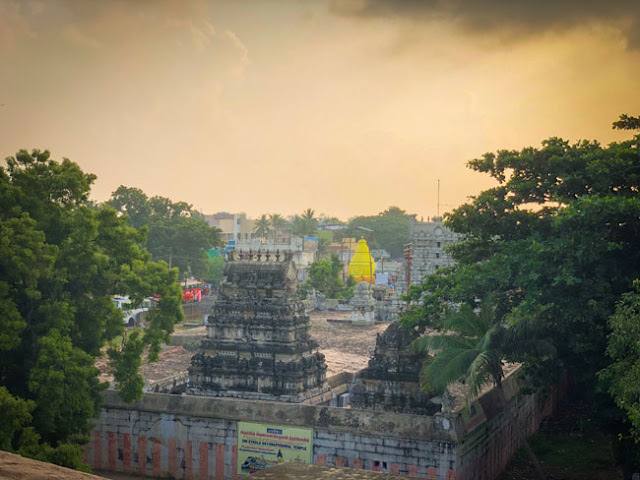 If you want up know even more about these local style, I recommend visiting the Sculpture Museum located on the way from the Shore Temple to the Pancha Ratha, close to the Bus Stand. How can you visit a beach and not jump into the sea right away! The beach isn't very clean, but it's a good enough for a cool dip on a hot day. There are no lifeguards around and the sea can be a little rough at times, do do use caution if you do decide to swim. While I was there, I did see many jumping into the sea, but most often they were foreigners. Right on the East Coast Road which connects Chennai to Pondicherry, there's is a Surf Club and you can certainly try out surfing there. If you don't know how you Surf, you can also learn it from the experts. It would certainly help if you have your own car because then you can go at your own convenience. Ever since I spent a healthy weekend at Atmantan near Pune, I've become a big fan of Ayurvedic therapies. 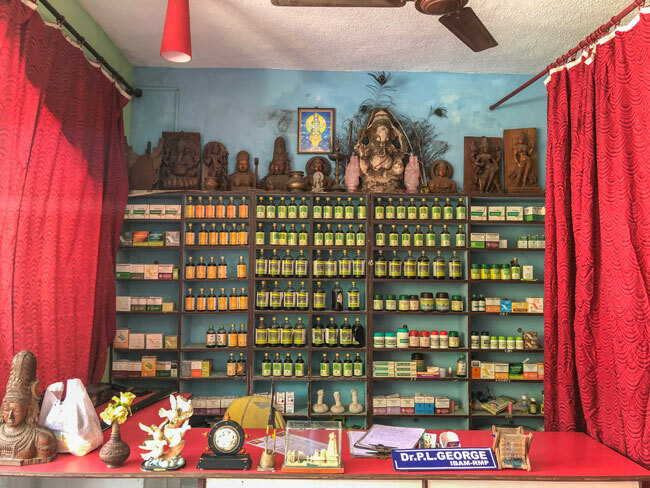 When I saw a few Ayurveda centres here, I decided to give it a try. My experience was actually quite decent and I would be happy to recommend it to fellow travellers as well. Small word of caution though - though my masseur was a through professional, I had to insist that I wanted at least a towel to cover my modesty. He told me that most of his international clients didn't care at all and not wearing anything actually helps him in full body strokes. Anyway, the choice is pretty much your own - either way I don't think it matters. Even in my case, I had to eventually let go of the towel because he complained so much about it. 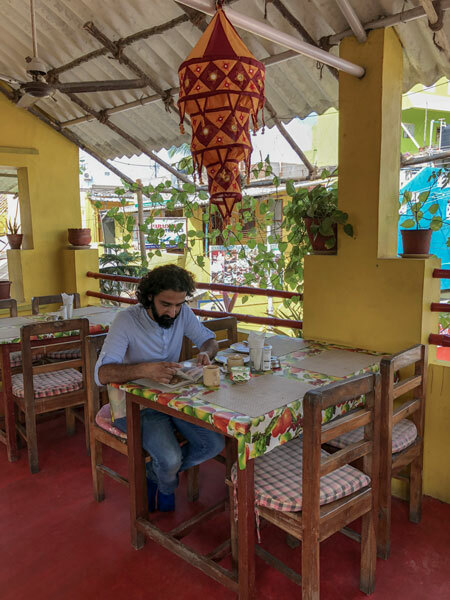 One of the things that surprised me a lot during my visit was the number of French cafes and restaurants in Mahabalipuram. Do check them out if you end up going there, they also serve some good French wine. I already mentioned about the French cuisine above, but that's not the only food you get there. There is Italian, Punjabi, Chinese and South Indian as well. 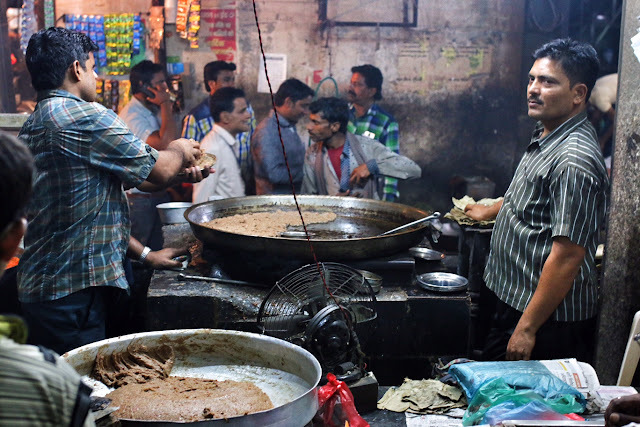 There are numerous local food shops especially in the area near the bus stand and they are extremely affordable. Wow, this is a tough question to answer. Mahabalipuram is one of those places where you have options to stay in all possible budgets. I actually stayed in a fairly affordable guest house, Sathish, and there are actually many more like that. Here are some well rated options on Booking, which is where I booked my room as well. It’s located about 58 km from Chennai and easily reachable by road. I traveled by bus (ticket coat ₹80), but there are many taxis also. It’s easy to drive down as well in your own car - this will allow you to stopover all along the way too. You can also take Zoomcar, and it's especially good if you are travelling in a group. Ola Outstation is also another idea, and you can stay overnight even with this option. Thank you for sharing this post really great and wonderful article. You are talking about Mahabalipuram which are really well-written.